A Modtran Mystery | Watts Up With That? This shows the situation during the subarctic summer, with no clouds or rain. Along the way, I ran into a curious mystery, one for which I have no answer. Here’s the peculiarity I found. I decided to see what Modtran had to say about the “instantaneous forcing”. This is the forcing immediately after a change in e.g. CO2 or other greenhouse gas. In Table 1 of “Efficacy of Climate Forcings” , James Hansen et al. say that the instantaneous forcing from a doubling of CO2 is 4.52 W/m2. Figure 2. Instantaneous forcing calculated by Modtran for different scenarios. Now, this has the expected form, in that the forcing is highest at the equator and is lowest at the poles. The addition of either rain or clouds reduces the forcing, again as we’d expect, except during subarctic winter when some kinds of clouds increase the forcing slightly. 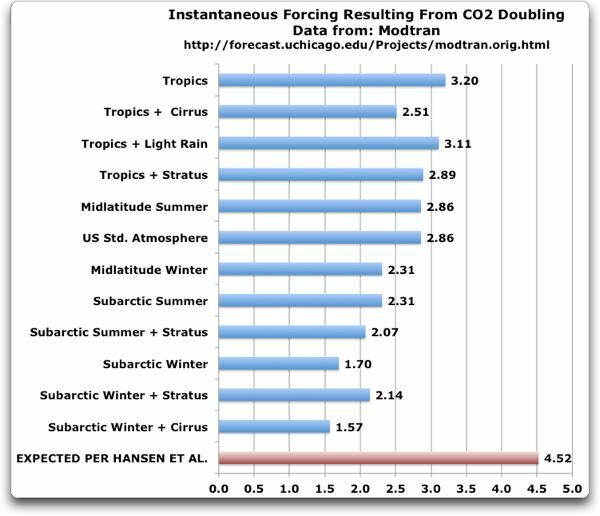 So the mystery is, according to Modtran, the absolute maximum instantaneous forcing from a doubling of CO2 is 3.2 W/m2 in the clear-sky tropics. I can’t find any combination of locations and weather that gives a larger value for the instantaneous forcing than that. And the minimum value I can find is subarctic winter plus cirrus, at 1.57 W/m2. I can’t find any combination giving less than that, although there may be one. As a result, according to Modtran the planetary average instantaneous forcing from CO2 doubling cannot be any more than 3.2 W/m2, and is likely on the order of 2.4 W/m2 or so … but according to Hansen et al., the real answer is nearly double that, 4.5 W/m2. So the mystery is, why is the accepted value for instantaneous forcing nearly twice what Modtran says? Note that the answer to the mystery is not “feedbacks”, because we’re looking at instantaneous forcing, before any response by the system or any possible feedbacks. DATA: Excel spreadsheet here. You don’t need it, though. For any situation, simply use Modtran successively for two CO2 values where one CO2 value is double the other, and note the difference in the calculated upwelling radiation. This is the instantaneous climate sensitivity for that situation. THE USUAL: If you disagree with me or someone else, in your comment please quote the exact words that you disagree with. This lets everyone know your exact subject of disagreement. NOTE: I see as I finish this that they have an upgraded user interface to Modtran here … the results are the same. I prefer the older version, the graphics are more informative, but that’s just me. Well, and I might be wrong, but the theory of CAGW does not rely on CO2 alone. The theory states that increasing CO2 leads to increasing H20 and the increased H20 creates hot spots in the tropics and it’s these hot spots (via more H2O) that do the warming. CO2 by itself can’t. I’ll only add (the good news) that no hot spot has ever been detected and no increase in H2O has been observed. Perhaps Hansen and company used LOWTRAN, back in the day it was used for quick rough calculations in the Electro-Optical world since even MODTRAN took a lot of computing resources and time (early 80’s). When we wanted/needed very precise results back then we used HITRAN, but the calculations were so expensive in time and computing resources that we kept the transmission results as tables for later use for as long as possible. From what I can recall the results from using LOWTRAN vs HITRAN could be enough to account for the delta you’ve found. Emission happens typically 1 ns after absorption. You ‘checked the reference’ on something ‘everybody knows’, and couldn’t replicate it. Interesting discussion around this going on at JC’s site. MODTRAN is very good at simulating the planet IR balance. This is because it was derived from the correct physics; 160 W/m^2 mean surface thermalisation. Because it’s proprietary, it can’t be ‘altered’. The IPCC climate model heat transfer is a scam, based on assuming the surface IR is at the 396 W/m^2 black body level, plus the convection and evapo-transpiration. They then put in fake cooling from the top by incorrectly claiming you can apply Kirchhoff’s Law of Radiation to the semi-transparent atmosphere. When the 40% residual extra energy has produced imaginary extra water evaporation and ‘positive feedback’, they offset it in hind casting by exaggerated low level cloud albedo. The planet has ~0.97 IR emissivity, used in MODTRAN. Spartacus – you seem to be familiar with MODTRAN. Has it been used in climate models? Does it handle clouds? Does it correctly predict daily surface temperature variations – a) in Sahara, b) in Kansas, c) in the Amazonia? In Table 1 of “Efficacy of Climate Forcings” , James Hansen et al. say that the instantaneous forcing from a doubling of CO2 is 4.52 W/m2. I can’t get the link to load, but my understanding has always been that CO2 doubling = 3.7 w/m2 was the generally accepted value. Is my memory faulty or is there some difference between the two references? Yes, this is very odd indeed. I look forward to an explanation from Nick Stokes! Isn’t it that the 4.5 W/m2 from Hansen is for CO2 itself in the atmosphere, but that is not taking into account the overlapping bands with water vapour? I would not rule out the possibility that the issue that you uncovered is known, but ignored by climate modelers. It would be just one more “parameter’ that needs to be “adjusted” to give them the answer that they want. Very similar to the residence time of CO2 in the atmosphere. When no one was concerned about it and it was a purely academic exercise the residence time was around 10-12 years. Once it became a “parameter” it was “adjusted” up to 100 years to fit the IPCC models. If the atmosphere were 10 meters deep. I might consider modtran predictions meaningfull. Modtran is just another simulation. No one it seems is intelligent enough to define, predict or measure molar absorptivity for gasses. It is clear that greenhouse gases do slow radiative cooling rate. H20 is usually over 10,000 parts per million n the tropics. Day night termperature ranges increase from the tropics to the poles. That change can be correlated with prevailing dewpoint. It cannot seen in a trace change in CO2. The idea of radiative forcing seems a violation of the laws of themodynamics whenever heating is part of the discription. NIST it seem cannot not tell us what ratios are for CO2 and H20, but 10.000 is a bit bigger than 400. Each graph must be anotated. Perhaps the word “instantaneous” has a different meaning in your neck of the woods. Please note we are not discussing water vapor feed backs or hot spots in this particular thread. Hansen’s claim of 4.5 W/m2 is the instantaneous value before the feedbacks kick in. FYI ” . . . Table 1 of “Efficacy of Climate Forcings” , James Hansen et al . . .” loaded a moment ago. The mystery is indeed deeper. Because the IPCC value for doubling from present is in fact about 3.7. Cited in many papers, including Trenberth and others. My money is on Modtran. Willis, I love your posts. I would like you to do modran for h20 at x y z dewpoints then take the residue out and feed it to modtran C02 and get .0001C or so feedback. I know modtran does not work that way. What is the dew point for 1000 ppm of H20. Spread sheet showing h20 ppm vs dewpoint temp. If it is linear, it should be the same thing but I think the doubling is usually taken from an assumed pre-industrial baseline of 280 ppmv. I’ve also seen the usual figure for unamplified CO2 to be 3.7 W/m2/K. This MODTRAN/HITRAN model is where I came in to all this climate mess. Years ago a friend sent be a link to Dr David Archer’s site where he had course notes and an interface to do this sort of simulation on either MODTRAN or HITRAN (can’t recall which). He was basically pointing out that cutting atmospheric CO2 in half would not make a bit of difference. Oddly ,since that time he’s turned his coat and now seems to be a confirmed warmist. Perhaps his V.C. had a word about where grant money comes from ! The main reason for that is in the influence of stratosphere. Radiative forcing is defined as a change in the flux just above troposphere after stratospheric temperatures have reached the new radiative energy balance, i.e., after the stratosphere has cooled. UChicago MODTRAN does not allow for cooling stratosphere. Results calculated at 17 km looking down are closer to the correct ones, but fully correct values require a model that makes the stratospheric corrections. You don’t actually think Hansen is telling the truth about “instantaneous forcing” do you? Please continue with your Modtran mystery research. May i suggest that you check heat balance and heat transfer in Modtran. How the energy that is radiated towards space at a certain level reach that level from earth. I have never been able to determine whether this MODTRAN calculation is for a one shot absorption by GHGs or whether it includes ALL of the multiplicity of absorptions and re-emissions, including the isotropic re-distribution that occurs at each and ever re-emission event. And if they are assuming a log base 2 behavior, that means they believe Beer’s Law applies, and it doesn’t because Beer’s law presumes the absorbed photons stay dead, and are never re-emitted at any wavelength. Consequently, I have no confidence in any such calculations. I also know what the logarithm function is; so a CO2 doubling is 280 > 560 ppm CO2 and it also is 1 > 2 ppm CO2, or one molecule > two molecules of CO2 per liter of air. The “observed” Temperature and CO2 data, track equally well, whether you take the log base 2 of the CO2 or log base 2 of the Temperature, or the log of neither. Namely they don’t track at all; see Monckton’s last 17 years and 8 months for example, plus Mauna Loa CO2 over the same time frame. I think the whole idea is rubbish (of CO2 induced warming). Something has changed in the online MODTRAN calculator. Hansen estimate does not take into account of overlap between CO2 and WV? I was curious where global warming was suppose to warm. Generally don’t think CO2 does much warming and few watts per square meter sort of goes along with what I assume. doing this should distort the results. But I also think by doing it regionally one also distorts the results. So I find it interesting and interest topic to discuss. Likewise, I would interested in comparison between night and day, though the winter and summer sort does this. It seems to be global warming is entirely about night time and winter increase in temperature, just any greenhouse effect on the Moon would be entirely about night time and polar warming. Or global warming is not going to increase daytime surface temperature on the Moon of around 120 C, but it could dramatically increase nighttime temperature on the Moon. And on Earth, if one talking about time of when Earth had average temperature of 25 C, I would not expect much increased temperatures in tropics [maybe less cooling at night in tropics] but mostly expect the Temperate Zones to have a significant increase in average temperature. Or it would be tropical in sense one doesn’t get freezing temperatures at night- and therefore tropical plants could grow in these regions- you can grow orange trees in Oregon or even Canada. In both cases (mine and Hansens) it’s from taking the current situation and instantaneously doubling the CO2, including all overlaps in both cases. FORTRAN? Now that brings back some memories. I didn’t know anyone used FORTRAN anymore. I wonder if they store the source code on punch cards? Just kidding, I loved FORTRAN. It’s cuz de heat is hidin under de clams in de oceans, doncha know. And dats a tragedy! Since you haven’t provided the slightest scrap of evidence for your claim that Modtran has significant errors, it seems that you are not intelligent enough to understand that on a scientific website, claims are meaningless without facts, logic, math, or observations to back them up. Assuming that scientists might be wrong is a good thing. Assuming that they are idiots is always a mistake. Scientists have problems, to be sure … but lack of intelligence is not generally among them. In fact, if you had taken the time to look at the manual and run the model and inspect the results, as most intelligent folks would do before commenting, or even read the caption to Figure 1, you’d have noticed that Modtran explicitly calculates the concentration of the variables at 33 of altitude levels, and uses that in the final calculation. The absorption curve should not be linear, check what it does with concentrations of 50, 100, and 200 ppmv. Thanks, Dave. According to your data at the link, the 2xCO2 forcing is 3.2 W/m2 … which is identical to my results in Figure 1. So I’m not sure what you mean. I calculated the CO2 forcing from your data as the I_out for 285 ppmv minus the I_out for 570 W/m2. Good question. It’s because the forcing is logarithmic (base 2). A doubling or a halving have inverse effects. Why do we have this discussion? It’s not CO2 and never has been. Wake up! It is the Sun. Remember, in 1970, it was the Solar constant. Now with Soho, we find the EUV [10.7 cm flux] varies wildly. The Flux is used to determine the amount of atmospheric drag on satellites. The Flux puffs us the upper atmosphere creating a “insulation blanket”. The CO3 [ozone] reflects [absorbs] the infrared from both the Sun and Earth. The increase in “insulation” prevents heat from leaving the North and South pole. The decrease in the Flux allows heat to escape. Watch the Antarctic set awesome new record ice extents due to the Flux being down [less than 140 during a Solar peak is a scary amount on low side]. Willis, try doubling CO2 from pre-industrial and see what you get. That isn’t an assumption of Beer’s law. If that were true, after a while the sample would transmit all light impinging upon it because all the molecules would have already absorbed photon. That isn’t how it happens – it is a dynamic equilibrium of absorption-emission. You raise an interesting issue, Coldlynx. Modtran is a radiation model and doesn’t deal with heat balance and transfer other than indirectly. By that, I mean that you can adjust surface temperature, and the model recalculates atmospheric temperature (at 33 levels) assuming that the lapse rate is unchanged. In other words, it cannot do what you propose because it is not included in the model. Note that this is not a shortcoming of the model. Every model only deals with certain things, you can’t escape it. It just means that you’ve picked the wrong model for what you want to investigate. However, none of that matters to this study because I’m dealing with instantaneous forcing, before any atmospheric or surface temperature response. Clue. If you have something to say, say it. Leaving clues doesn’t work. What Roy Spencer says – 285 and 570 rather than 375 and 750. Probably a log relationship (or two) rather than linear. Interesting question, Dr. Roy. It turns out I had tested that before writing this post, and it’s the same, e.g. tropics clear is 3.2 W/m2 per doubling of CO2. By the time we get to the doubling from 160 to 320 ppmv, the change in forcing has stabilized at 3.2 W/m2. This agrees with my results looking at the doubling from 275 ppmv (pre-industrial) to 550 ppmv, which gave 3.2 W/m2. OK – When all else fails then either Hansen or Modtran is wrong. I know who I’m betting on. Boy, does this bring back memories. I wrote a program at GSFC during 1972-1982 called the Synthetic Spectrum Program (SSP) (re: Rudy Hanel, Virgil Kunde, et al.) with parameters to describe the various atmospheres we wanted the simulate in the IR for remote sensing analyses: Earth, Mars, Jupiter and Saturn. It was written in FORTRAN. I remember a copy was sent to NCAR in the early 80’s. I verified that the program (substantively unchanged) was still in use in the mid-90’s. I wonder how much of that program is the basis for later models? The SSP did a very good job in a clear atmosphere. Clouds & aerosols were (and I think still are) a confounding problem that we were not able to solve then. You say “which calculates the result for each 1 cm-1 wide band of the wavenumber across the spectrum.”. I might believe 1um. Or 100nm. Or 10nm. (I know nothing of MODTRAN) But 1/1cm seems rather broad. At 1cm you are more into microwaves than light. Although really it is all light. But common nomenclature. I’m a Forth guy. But I play with bits. And controlling things. In real time. Thanks for answering my Q before I could ask. And also thanks for your thoughtful inquiries. So Modtran could also mean MODEL Fortran? Has anybody actually, like, MEASURED this stuff? My default suspicion says : No, not really possible. But we sure can guess good. P.S. I’m not a computer geek, just somebody who understands how really difficult it is to actually collect good data in the real world. where C is the CO₂ concentration in parts per million by volume and C₀ is the reference concentration. If C/C₀ = 2, that is, for a doubling of atmospheric CO₂ concentration this formula gives 3.7 W/m². However, the term “radiative forcing” in this case is probably not equivalent to the “instantaneous radiative forcing” used by MODTRAN. The wiki value may be related to the IPCC usage. The radiative forcing of the surface-troposphere system due to the perturbation in or the introduction of an agent (say, a change in greenhouse gas concentrations) is the change in net (down minus up) irradiance (solar plus long-wave; in W/m²) at the tropopause AFTER allowing for stratospheric temperatures to readjust to radiative equilibrium, but with surface and tropospheric temperatures and state held fixed at the unperturbed values. 2. allowing one side to adjust while holding the other side fixed excludes empirical testing. This latter usage at least treats the entire atmosphere uniformly. Which is preferable, since heat capacity of the stratosphere is negligible, so the surface along which “forcing” is defined can be moved upward at leisure. Forcing at ToA (Top of Atmosphere) is the same as at the ill defined tropopause. Now, the stratosphere is supposed to cool down with increasing GHG concentration. If this cooling is taken into account while the troposphere below is “held fixed”, it should increase radiative loss through the tropopause, because there is a larger temperature difference. Therefore the 3.7 W/m² given by the IPCC is an upper bound to instantaneous radiative forcing, which is consistent with your thought experiment using MODTRAN, but excludes higher values. The NASA GISS ModelE Climate Simulations page you were referring to uses a somewhat more consistent termonilogy. – “Fi”, the instantaneous forcing, is the radiative flux change at the tropopause after the forcing agent is introduced. – “Fa”, the adjusted forcing, is the flux change at the top of the atmosphere (and throughout the stratosphere) after the stratosphere is allowed to adjust radiatively to the presence of the forcing agent. Note the Fa > Fi relation does not hold for Model E, which is truly amazing. But hey, all models are wrong, but some are useful. And in this case the higher the values are the more fit for purpose they’ll be, provided the “purpose” is to generate scare. Otherwise all such calculation, including MODTRAN is based on assumptions about the “average” atmospheric temperature/moisture profile in different regions and/or under different meteorological conditions, which may or may not be adequate. I reckon even the IPCC adjusted forcing estimate of 3.7 W/m² is too large (derived for the US standard atmosphere or some such artificial constuct). Based on your fiddling with MODTRAN it should be below 3 W/m² (but probably above 2.4 W/m²). Relation between reality and theory is always difficult. For instance we understand clearly why the stratosphere should cool down with increasing GHG concentrations. And indeed, according to RSS, during the past 35 years temperature of the lower stratosphere has decreased at an average rate of -0.28 K/decade. The only trouble is that almost all the decline happened close to the beginning of observations, during the last 2 decades this rate is only -0.03 K/decade, almost an order of magnitude smaller. Nope, can’t load it. Even googled it, comes up with the link, can’t load it. Tried multiple browsers. I going to go all conspiracy and wonder if Canadian IP addresses are being blocked to prevent Steve McIntyre from looking at their data. Not a big deal, but the 3.7 versus 4.x things is the real mystery to me. I don’t think they explicitly state it in AR4, I think you have to go back to AR3 or Ar2 to find the number, but 3.7 is what I’ve always seen quoted before. I’m not sure if this has any relevance, but I notice Hansen defined fi to be the forcing at the tropopause, rather than TOA. MODTRAN in the screenshot appears to be set at 70 km altitude. Is it possibly being affected by absorption/overlap in the stratosphere? I interviewed for a job about 15 years ago that involved patching and updating an extremely complex program that was still in FORTRAN. A reciprocal centimeter bandwidth is just an increment of the spectrum over which the calculations were performed. It is equivalent to going through the absorption bands in a fairly detailed way. At 10 microns in the NIR, once reciprocal centimeter would correspond to a wavelength band of about 1 Angstrom; i.e. 10^-10 meters. In the earlier 1979 NAS report (p. 7), the radiative forcing due to doubled CO2 is estimated to be 4 W/m2, as calculated (for example) in Ramanathan et al. (1979). In 2001 the IPCC adopted the revised value of 3.7 W/m2, the difference attributed to a “stratospheric temperature adjustment”. So Hansen disagrees with the IPCC? Who should we believe now? IPCC? Hansen? Modtran? The debate is so messed up we don’t even know which version of wrong to debunk! Willis, I don’t have any answers for you but once the energy is absorbed, it is re-emitted and has a new opportunity to be absorbed again so I’m not sure that a single absorption calc covers the situation. Each time I’ve used Modtran, it failed the “practical test” of real world conditions: Predicting long wave radiation back away from a surface into a “sky” condition of specific pressure, 2 meter air temperature, ultimate Tsky temperature, relative humidity, and clarity. The program lists conditions for different environments: Willis has them above in the header paragraph. But those “generic” Arctic or Kansas wheat field” conditions did not ever appear to answer the general long wave radiation question for a specific series of weather conditions, surface temperatures, and surface emissivities. Not quite. The term wavenumber is defined as the inverse of the wavelength in centimeters. Thus, a wavelength of 10 microns corresponds to 1000 wavenumbers, or 1000 cm^-1. A change of 1 cm^-1 at 10 microns is a change of 1 part in 1000, or .01 microns, 10 nm. The reason that wavenumbers are used is not to make things complicated; it is rather that the energy of a photon of radiation is proportional to its frequency, and the frequency of electromagnetic radiation is the speed of light divided by the wavelength. Thus the wavenumber is directly proportional to the energy of a photon, and what is perhaps more important, absorption and emission lines and bands tend to have about the same widths in energy terms, thus in wavenumbers, no matter what the frequency is [when they are due to similar physical processes]. It is very reasonable for MODTRAN to use wavenumbers, and 1 cm^-1 is, in fact, a medium spectral resolution, both in radiation physics and instrumental terms. The problem is that instantaneous radiative forcing actually gives no true answer to the change in atmospheric temperature profiles due to changing radiative gas concentration. What do radiative gases do? Warm low down cool high up. This increases buoyancy imbalance and increases the speed of vertical tropospheric circulation. This non-radiative transport combined with evaporation is the primary energy transport mechanism away from the planet’s surface. Increased radiative gases speed up the primary energy transport mechanism away from the planet’s surface. It should also be noted that the role of radiative gases in radiative subsidence of air masses from altitude is critical in tropospheric convective circulation. No radiative gases, and this circulation will stall. The lapse rate is a product of strong vertical circulation across a pressure gradient. Without this circulation, the lapse rate would trend isothermal via gas conduction. Assuming constant lapse rate or speed of vertical circulation for changing radiative gas concentration is a dead end. Hold these constant for increasing radiative gases and the flawed models of the climastrologists will always show low altitude warming. … Has anybody actually, like, MEASURED this stuff? My default suspicion says : No, not really possible. But we sure can guess good. Thanks, Jeff, always good to hear from you. The close correspondence between model results and observations makes me think that they deal with that in some fashion. Here’s the link from above if you missed it. PS—for those who don’t know of Jeff’s work, a trip to his website is almost always worthwhile. But look at the two cases in that graphic heading: The IRIS satellite is for the Sahara – I assume they means its IR measurements while the satellite was above the Sahara desert at some surface temperature, altitude, relative humidity and pressure – and the MODTRAN results are for a 22 deg C ! simulated surface at 325 ppm CO2 (not seen since perhaps the early 1950’s) for a tropical environment. So, is this not a case of the two results lining up fairly closely at several radiation bandwidths, but for two very, very different conditions? At a minimum, the CO2 levels in the simulation need to be 390-400 to match the satellite era – and CO2 is even than average earthwide over the deserts!. And the actual surface temperature of the Sahara when the IRIS satellite was overhead needs to be matched with the MODTRAN simulation for that Sahara relative humidity and Tsky emissivity. Beers Law, is a law from chemistry about the absorption of some “specific wavelength” by some molecular species in a dilute solution of that species. It asserts that a path through such a solution absorbs a fixed percentage of the incident radiation for each length increment of the path length, or alternatively as a function of the concentration of the absorbing species. So if a one cm path absorbs 10% of the INCIDENT RADIATION at that specific wavelength, the next cm of path will absorb 10% of the remaining radiation of that incident wavelength., or if you like doubling the species concentration in a fixed path length , will absorb 10% of the incident, plus 10% of 90% of the incident radiation. It applies ONLY to the ABSORPTION of the incident radiation. It does NOT apply to the TRANSMISSION of energy through the sample, because most if not all materials RE-RADIATE the absorbed energy as some other wavelength radiation. I have color glass filters which will extinguish a specific wavelength by four orders of magnitude; yet they transmit over around 50% of the radiant energy but at a lower frequency radiation. A claim of logarithmic absorption of radiation with concentration of an absorbing species, IS an assertion that Beer’s law applies. It virtually NEVER applies to energy transmission, because the radiant energy refuses to stay dead. If radiant energy is absorbed,, and not re-radiated as some fluorescence, or in the case of gases, the molecule returning to the ground state, then the Temperature must increase, and the energy either conducted away as heat, or else the material will radiate a thermal radiation spectrum based on the higher Temperature. GHG absorption in the atmosphere does NOT obey Beer’s law, so it isn’t logarithmic, with concentration or thickness. …..t = t0. exp (-alpha .s) is totally a consequence of Beer’s law assumption. So what if an undetected thermal radiation appears mysteriously as a result. Ocean warming is what leads to increased ocean energy emission in the LWIR, long after the chap who measured alpha has gone home to sleep. If I wanted to start a fight ……..
Never mind, Willis has a new post. But look at the two cases in that graphic heading: The IRIS satellite is for the Sahara – I assume they means its IR measurements while the satellite was above the Sahara desert at some surface temperature, altitude, relative humidity and pressure – and the MODTRAN results are for a 22 deg C ! simulated surface at 325 ppm CO2 (not seen since perhaps the early 1950′s) for a tropical environment. Sorry, RA, but you need to read a bit more carefully. The graph (see the red type) says that the surface temperature is 320K, which is 47°C, not 22°C. So that’s likely quite close to actual conditions. Next, the IRIS data is from 1972. And the NOAA MLO CO2 data gives the 1972 CO2 concentration as 327.45 ppmv … they used 325. Again, right there with the actual conditions. Finally, they’ve cut the relative humidity in half, likely a reasonable approximation for the dry desert air. So in fact, they’re using something very near to the actual conditions, not “very, very different conditions” as you claim. Actually Richard G raises a good point. Measurement from satellite is not what is required here. The correct empirical approach is simple and far cheaper than launching remote sensing assets. All that is required is a flight of aircraft flying in vertically separated formation, 500′ to 40000′ simultaneously through the same airspace. LWIR sensors scanning 360 degrees perpendicular to flight axis. Gas sensors analysing radiative gas concentration. Repeat on different days and sky conditions in the same airspace. But such as simple empirical experiment would give the “wrong” answer. No average EEH or ERL. Atmosphere radiating in 3D from clumps. Atmospheric “IR “window” constantly changing. No hope of using averages. I have checked measuring sky LWIR from the ground. The pattern of emission is constantly changing from even to clumped. Constantly changing altitudes of emission and the IR window always fluctuates. And that is just one location. Regional differences would make a joke of averages and the whole EEH game. I was under the assumption that cooling the stratosphere ( which yields ‘adjusted’ response, not instantaneous ) tended to reduce forcing. I have been running some runs using the CRM ( column radiation model ) which used to underlie the CCM and found that the ‘adjusted’ forcing is greater than the ‘instantaneous’ consistent with what you have found. I’m not sure you can calculate the ‘adjusted’ by using this tool because it doesn’t allow you to specify a given profile for one run, then the same profile with a stratospheric cooling for a 2x CO2 scenario. Hansen probably didn’t use actual data, but a model and then an inserted constant to be consistent with the model. So 4.52 W/m2 might be based on what would be expected from greenhouse gas models, based on an inserted value or ‘constant’ picked out of thin air. I found this sort of thing when I was directed to papers Hansen wrote on atmospheric equilibrium, to try and determine whether the sun’s high activity in the 20th century has reached equilibrium in the atmosphere, I found in his papers that a constant was inserted into the equations to give a result that the atmosphere was currently not in equilibrium, meaning ‘more warming is in the pipeline’ from greenhouse gases, and it was clearly stated that the constant was based on greenhouse gas modelling. So to try and determine what greenhouse gases are doing, insert constants to make sure the result is consistent with greenhouse gas modelling. Wella!. The data can then be adjusted or ignored. Use HITRAN line-by-line calculations. That’s how 3.7 W/m^2 was calculated. It’s more accurate than band models. So I calculated Modtran at 17km, tropics. Well Max Planck simply asserted that electromagnetic radiation carries a quantity (h) of “action”, about 1E-34 Joule-seconds, for each cycle of the EM wave. Well some people use hbar instead, but they are using the action for each radian of the EM wave, rather than each cycle. So each 3.4 /m/2 is suppose to add 1 C? And why doesn’t start at ppb. Though Earth has never had less than 160 ppm, and doubtful CO2 anywhere in universe will be below 10 ppm. Another very interesting article from Willis. This is habit forming. I’m not quite there yet. But it is clear from real world observations that if CO2-induced warming exists, it is fantastically exaggerated. If it does exist, it is so small that it can be completely disregarded. george e smith, you are correct, I was thinking of a dilute gas phase scenario, not a solution. Dang, Nick, you surprise me … well spotted. I often forget that when the IPCC says “Top Of Atmosphere”, they mean the top of the atmosphere … except when they mean “Middle Of Atmosphere”. I don’t think that’s all of the answer but I suspect it’s most of the answer. However, that brings up more issues. FIrst, as you point out, Hansen says that the radiation at the tropospheric level is a good approximation, not of Fi (instantaneous forcing), but of Fa (forcing after the stratosphere changes temperature. I fear I don’t understand that. IF the instantaneous forcing Fi at the tropopause is really the adjusted forcing Fa … then what is Fi itself? It has to be larger than Fa, by definition. Next, you’ve got the plan but your calculations are incomplete. To complete them, you need to subtract the downwelling forcing at the tropopause, because Hansen is discussing net forcing (up minus down). Here are those figures for clear-sky tropics. Curiously, this increases the calculated value of the change from what you found (4.5 W/m2) to no less that 5.6 W/m2. And this puts it into fairly good agreement with Hansen’s results, which show about 5.2 W/m2 in the tropics. But that’s for Fi … and he says that what I’ve just measured is a good approximation of Fa. This is one reason that I find this whole approach crazy. The problem is that it’s not possible to measure something “at the tropopause” in any but the most general way. In addition, I fail to see the diagnostic value in measuring the radiation in the middle of the atmosphere. If you do that, then if the stratosphere warms slightly and the troposphere cools slightly, the “TOA” radiation changes with no change in the global energy balance. How does that not make it useless as a tool to diagnose changes in the overall energy state of the system? The stratospheric state is determined by the radiative equilibrium condition. The stratosphere and troposphere irradiances are together constrained by the requirement that the top of the atmosphere net total irradiance (i.e., radiative energy absorbed minus that emitted by the Earth’s entire climate system) must be zero at equilibrium. Clearly, they are NOT using the TOA balance to mean the balance at the tropopause, but at the actual top of the atmosphere. And the same is definitely true about the Chapter in the AR4, the one entitled “Top Of Atmosphere Radiation“. There, TOA means “as measured by satellite”, just as you would imagine. CERES uses the same terminology, where TOA means the radiation actually entering or leaving the system. So I forget about the bizarre corner of the IPCC world where TOA means troposphere. In any case, Nick, credit where credit is due—even though your calculations were incomplete, I do think you’ve solved the mystery. I know I’ve been on your case in the past, but in this instance, you da man. My congratulations. Best regards to all, and my thanks to Nick for actually doing the calculations. HITRAN is the database not the model. MODTRAN can be “altered” in fact during the 1980s our group submitted many upgrades to LOWTRAN that made it into MODTRAN. But your changes have to be validated. MODTRAN is a ENGINEERING TOOL. we use it to build working Machinery that protects our nation. Simple example. In the design of the F-22 and F-35 one critical aspect of survivability is the probability of detection and engagement by a ground based system. Testing would consist of the following. Since the aircraft wasnt built yet you had to predict what its broadband signature would be.. either in RF ( Radar cross section) or in IR.. The IR signature would be a 3D volume in three different bands. One for Hot gas, one for aero heating, and one for hot metal parts. These signatures would later be measured when you had real aircraft. but you had to use validated codes to predict your signature. on our projections of soviet technology. This was known as Threat Analysis ( I did that for about 5 years ). It basicaly comes down to S/N ratio and a probability of detection. Now that you have a ground site and an aircraft you run a bazillion different profiles using lowtran or modtran ( depending on the requirements) Those profiles give you a probability of being detected and engaged by the ground site. then comes launch, guidance and kill estimation. These profiles are basically footprint diagrams around sites.. and so you get Pd as a function of speed, altitude and signature. That is, given a signature and an altitude and a speed you get a detection footprint around the site.. you can also use this in mission planning to avoid detection. So the same technology would be used in providing mission planning for a UAV that needs to penetrate an airspace undetected. Does it work? is the physics sound? ask the fricken bad guys. Opps you cant, they are dead. Silly Willis. You just forgot to check the box for the “applyn 10.76 mw-ovens for 30 minutes” option under the Trenberth tab . I am forced, from my experience and firsthand knowledge of relevant DoD systems, to confirm the substance of what Mosher is saying above. MODTRAN is indispensable in these systems and has proven its real world accuracy time and time again across many applications. However, I cannot say I agree with the manner in which he said it. Can’t we treat each other well, even those who annoy us? It would appear the Hansen et al worked backwards from their temperature estimate of 3C. There was an interesting post a while back from a chap who had somehow managed to engage Gavin Schmidt in a discussion (possibly by playing really dumb and impressionable). He managed to drop a really tough question as to what plans were in the works to change the models to more accurately reflect reality. Gavin’s reported reply was that the CO2 response in the models was an emergent property of the equations and that these equations could not be changed without affecting a lot of other stuff. What the Air force was interested in was radiative signal from the air to the ground. This direction is akin to incoming solar radiation, a significant portion of which is near IR, and CO2 is a very small player in these spectra. I don’t know what temperature a plane radiates at but I bet it’s a lot hotter than the ocean. What temperature profile did you use? Over the “tropics” (actually over the half of the planet centred on the latitude at which the sun is overhead), the temperature profile is not “American Standard” (tropopause 11-20km) but a profile where the Tropopause is a single point of inflection at an altitude of between 14 and 18km. The strong emissions from the centre of the CO2 absorption band, roughly 630-710 cm^-1, are from an altitude of 15km at least, if they are to get to Space, that is they are mostly from the Stratosphere, not the Troposphere, in the tropics. The implication is that emissions to Space from this band will INCREASE in the “Tropics” when CO2 is doubled, whereas over the Temperate zones there will be little change in emissions because of the extensive tropopause. So the “radiative forcing” increase obver the tropics should reduce due to the increased stratospheric emissions. Your last comments are what make this site special. Real science gets sorted out and understood without a lot of bluster and BS. Well done! The answer to you question is not a secret: positive feedback from water vapor. That’s why Svensmark’s theory is so important to confirm or falsify. If Svensmark’s theory is correct, then under certain circumstances, water vapor in the atmosphere causes cooling by negative feedback. in any case, what Mosher said. The profiles are all set by the model. There are six profiles: tropic, midlatitude summer and winter, subarctic summer and winter, and US standard atmosphere. If you set the “Save” dropdown in Modtran to save the results, you can then run a scenario, take a look at the results, and see the entire thermal profile. I hasten to point out; nobody should think that I believe CO2 and other GHG don’t do anything in the atmosphere. That is NOT my point. The physics of molecular vibrational and rotational absorption spectra, which are typically manifested in the LWIR (and longer) region is well established, and that is NOT a hill “skeptics” should choose to die on. But there are a lot of things, which do stuff in the atmosphere physically, that are well researched. But do you guys, and gals ever read and understand some of the stuff Willis puts up here. Did you not read his account of the MEASURED drop in surface solar brightness, in Hawaii, due to attenuation by major volcanoes, that persisted for some months. This is short wave solar energy that did not reach the ground. And Willis showed that the Temperature signal from that MEASURED drop in surface solar irradiance, DID NOT even show up in the MEASURED Temperature record (even locally). Roy Spencer nailed it; there’s a very powerful negative feedback loop operating via the clouds that simply wipes out all of these gnat level pestilences like CO2 and aerosols, and TSI variations, and a whole host of other things. So long as Earth has its oceans, we couldn’t change the Temperature of this planet, if we wanted to. And if we could, what would YOU set the thermostat to ?? And WHY ?? Well said that guy, George. Conclusions are so much more interesting than graphs etc. First I asked MODTRAN to calculate Iout for various CO2 levels at ground level temperature of 299.7 K, and compiled them in column C. Those numbers are identical for the two MODTRAN versions. Then, using constant water vapor pressure (i.e., no water vapor feedback) I found the temperature offsets needed to maintain the “current” (Dec. 2011) Iout at each of the other CO2 levels. (Some trial & error was required.) Those results are compiled in column D, and the numbers were again identical for the two MODTRAN versions. Then I did the same thing using constant “relative humidity” instead of constant water vapor pressure (i.e., including water vapor feedback). The results from the old MODTRAN page are in column E, and the results from the new MODTRAN page are in column F. They are very different! The results from the old MODTRAN page showed water vapor amplification for clear sky and tropical atmosphere to be about +65%, but the new MODTRAN page calculates it to be only about +8%, i.e., almost, as Ferdinand said, exactly the same as with constant water vapor pressure. I also did those calculations for one of the supported cloud scenarios; those results are in columns G & H.
Back in January I started to compose an email to the folks at U. Chicago, asking them about the discrepancy, but I never finished it and sent it. 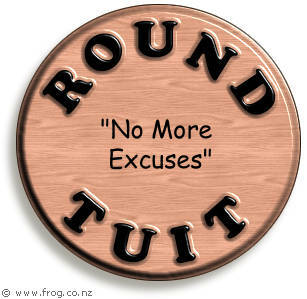 Thanks to this thread, I finally got a round tuit tonight. Perhaps they can figure out what’s wrong. The answer is in the source code – Fortran reads easy, unless the coder has NO style and desire to document with clear and meaningful comments. There is another way to look at this issue. Radiative forcing is based on the assumption of an ‘equlibrium atmosphere’ in which perturbation theory is used to ‘predict’ the effects of an increase in atmospheric CO2 concentration on surface temperature. It is a mathematical ritual that has no basis in physical reality. There is no equilibrium, and it goes downhill from there. MODTRAN is a medium resolution radiative transfer program that was developed initially by the Air Force Geophysics Lab. It is a lower resolution adaptation of the HITRAN database that is much less computer intensive. Rather than follow the radiative forcing ritual, MODTRAN gives a ‘snapshot’ of the atmospheric flux based on the spectral data and the given atmospheric temperature and species profile. The Earth’s surface temperature is determined at the surface by the net heat stored in the surface layer. MODTRAN can provide the downward LWIR flux reaching the surface by setting the altitude to zero and looking upwards. When the CO2 concentration is increased from 280 to 380 ppm, the increase in downward LWIR flux reaching the surface is approximately 1 W m^-2. The values depend on the atmospheric model chosen and the defaults used in the U. Chicago version of MODRAN. The diurnal solar flux is zero at night and may reach 1000 W m-2 in the middle of the day for full summer sun/tropical conditions. 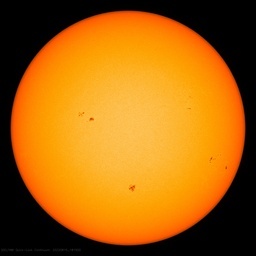 There is no such thing as an average solar flux. Over land, the solar heat is dissipated by a combination of moist convection and net LWIR flux. Some of the heat is also conducted below the surface and stored in the ground where it is released later. Daytime surface temperatures can easily reach 50 C. In order to determine the change in surface temperature it is necessary to perform the full engineering calculation of the short term surface energy transfer in 0.5 to 2 hr steps. The correct physics question is then ‘How does the increase in LWIR flux at the surface change the surface temperature?’ Using the 2008 data from the Ameriflux UC Irvine ‘grasslands’ site and a value of 1.7 W m-2 for the increase in LWIR flux from CO2, I obtained an approximate upper limit of 0.07 C.
Now, this is for the surface temperature. The weather station temperature is the meteorological surface air temperature (MSAT) measured at eye level in a ventilated enclosure, 1.5 to 2 m above the ground. There can be no CO2 signature in the MSAT record. The ‘hockey stick’ is based on changes in ocean surface temperatures. The weaterh station temperature climate record is dominated by the AMO, because of the area averaging etc. The oceans behave rather differently. For ‘pristine’ ocean, 50% of the solar flux is absorbed in the first 1 m depth and 90% is absorbed in the first 10 m depth. The LWIR flux is absorbed and emitted within the first 100 micron. The dominant ocean cooling term is wind driven evaporation, which also coupled to the surface. A change of 1 W m-2 in the LWIR flux has no effect on the measured ocean temperature. If you dig a little deeper into the radiative transfer calculations, about 75% of the downward LWIR flux reaching the surface comes from the first 100 m layer of the atmosphere. (This value also depends on the humidity). Almost all of the downward LWIR flux comes from the first 2 km layer. The moist convection transports the heat to higher altitudes where it is radiated to space. The upward radiation to space by the atmosphere is decoupled from the surface temperature. Some of the LWIR flux however, also escapes to space through the LWIR transmission window (~800 to ~1200 cm-1). Rather than argue over meaningless forcings, feedbacks and climate sensitivities, perform the real engineering calculations of the climate heat transfer. CO2 induced global warming then disappears into the noise of the surface fluctuations. There is no such thing as an average climate, average temperature or average flux. What’s the definition of parameter Water Vapor Scale in MODTRAN? Once a number is settled on, it has to be integrated (averaged) over geographic conditions, diurnal and seasonal cycles before we get a true comparison with the 1365/4 number for inbound flux. Does anyone have a reference to where this has been done? Later, Nick Stokes gave the same answer, but actually provided numerical results, which was more useful. “So I calculated Modtran at 17km, tropics. Willis then noted we have to calculate the net flux at the tropopause, up – down flux, which increases the forcing to CO2 doubling in the tropics to 5.6 W/m2. The IPCC says the global CO2 forcing is 3.7 W/m2 per doubling at the tropopause. I used Modtran to calculate the total earth CO2 forcing and got 4.62 W/m2, significantly higher than the IPCC value. Modtran calculates clear sky values in three regions; tropics, mid-latitudes and polar. I assumed the year average is the average of the summer and winter forcings for mid-latitudes and polar region. So the real mystery is why Modtran gives such high CO2 forcing numbers. I suspect the answer is that the water vapor concentrations assumed in Modtran are too low. In my calculations I am not using the 1976 US Standard Atmosphere, which is known to have too low water vapor. But I suspect that the three regions also use too low water vapor, which would make the calculated CO2 forcings too high. Maybe it would be smart the remove CO2 in total, because the effect is zero. Every time CO2 comes in it is a theoretical deal. CO2 is the effect, not the cause. CO2 comes after water vapor, not before. That’s why you get strange answers all the time because you do the science wrong just like AGWers do. Lapse Rate. The higher radiation goes before it encounters a CO2 molecule the less energy it will radiate back. At the end of the day I find we are in agreement. Thanks again for spawning a great thread. I wasn’t disparaging good work done by smart people,simply trying to stay humble about what we are able to do. The discussion gets lost in radiative physics and I just can’t divorce it from all of the kinetic stuff that dominates the world I live in down here in the troposphere, giving rise to the need for barf bags, dramamine and weathermen. (Hat tip to Anthony). The world is full of curve balls, wind shear and rogue waves. Stay safe. Perhaps the word “instantaneous” has a different meaning in your neck of the woods. Oh no! Thanks for the correction. COBOL and FORTAN are still in widespread use. Btw. Fortran was called FORTRAN up until and including the 1978 ANSI standard. After that it was “Fortran”, it was never “ForTRAN” as the article suggests. Forgive my ignorance, I’m new to MODTRAN, but I thought I’d take a look up from the ground and observe the infra red coming down. I put zero in for the height above ground and also put zero in for the amount of CO2, CH4 and Ozone. I set the locality to Mid Latitude summer with no rain or cloud cover ,( just leaving H20 vapour, O2 and N2 presumably) and changed the display to wavelength. I observe a near blackbody curve at approx 10um corresponding to a temperature of about 290K, with a chunk taken out of it. So where’s it coming from as it isn’t the Sun, that has a different blackbody curve. I thought gases only emitted spectrally. Looking up also makes it easier to see the amount of back radiation coming down due to changes in CO2. A doubling of CO2 gives a change of down radiation of approx 2.1 W/m2. Willis, you used modtran to calculate the impact, from what I can understand Hansen did not necessarily use modtran. Has he in fact stated how he came by his number and how can one critique a result if the methodology usewd to compute it is not known? However, when faced with a result one is not sure about, a very good way to check it is to calculate the result by some completely different means and see if the results roughly agree. In this case, Heinz Hug has measured the absorptivity of the atmospheric column of CO2 at 280 ppm as around 2000 abs. If we take the saturation point of the line center as approximately 2 abs (an amount that would absorb 99% of incident 14.7 micron radiation) that means the atmospheric column at 280 ppm is about 1000 times the saturation point of the line center (the logarithmic relationship starts when the line center saturates because from that point on incremental absorption is due to line broadening and thats a logarithmic relationship). 1000 time saturation is 10 doublings (2^10=1024). Now the generally accepted contribution of CO2 to energy retention is around 27 watts/sqM to 32 watts/sqM. That means the sensitivity is between 27/10 and 32/10 or 2.7 to 3.2 watts/sqM which agrees very well with your modtran result. For Hansen to be right, the contribution of CO2 to warming would have to be around 45 watts/sqM which I have not seen suggested. For anyone claiming that CO2 does indeed retain 45 watts/sqM the calculation is a simple one. The impact of CO2 is to block radiation from the surface (over the absorption band) and replace it with radiation from the top of the CO2 column which is about the tropopause – 288K for the surface versus 220K for the tropopause. Numerical integration of pascals equation for the two temperatures over the line width and making some allowance for the imapct of clouds yields a difference in emission to space between no CO2 and CO2 at 280 ppm of around 27 watts/sqM. My money is on your result. One point of very considerable interest (although not unexpected) in the plot you showed is the spike in the middle of the CO2 absorption band and the spike in the middle of the O3 absorption band. This shows that CO2 is NOT well mixed in the stratosphere as many sources claim but instead is highly stratified pooling in the lower stratosphere where the temperature is almost the same as at the tropopause. It [ Beer-Lambert Law ] does NOT apply to the TRANSMISSION of energy through the sample, because most if not all materials RE-RADIATE the absorbed energy as some other wavelength radiation. More problems with Beer-Lambert. Necessary conditions for its application include homogeneous, no scattering, same length of medium and monochromatic. Homogeneous, no. The atmosphere has a pressure, temperature and density profile. Scattering, yes. The sky is blue and clouds are white. Monochromatic, no. Sun’s light has a range of frequencies. Beer-Lambert Law is incorrectly applied to the atmosphere. Radiative-convective models are wrong. I used IR spectroscopy and beer-Lambert Law as an analytic tool in 1970’s. Extending it, wrongly, to the atmosphere is due to IR trained graduates looking for research money and politicians looking to demonize CO2. The 3.7 W/m2 from doubled CO2 that is commonly used by climate science and the IPCC come from Myhre 1998. This paper used Hitran. (the climateaudit link to the paper seems to be the most stable of the 2 or 3 out there). This paper made an adjustment for the shortwave impacts in the stratosphere. This is also where the formula 5.35 ln(CO2ppm/CO2orig) came from. It is remarkably lacking in detail and explanation. Myhre hasn’t done much since this paper. Sometimes, doubled CO2 forcing estimates also includes the impact from Methane, N20 and the CFCs that are expected to be there when CO2 reaches doubling which can bump the forcing number up to 4.2 W/m2 which is the number I always use. But this forcing is not showing up. The TOA energy imbalance is only 0.6 W/m2. The oceans, land and atmosphere are only accumulating 0.5035 W/m2. Where is the 5.35 ln(397/280) = 1.9 W/m2 CO2 forcing and the additional 0.8 W/m2 from all other GHGs showing up? It’s not there because the tropics have a strong negative feedback. If it works radiative forcing from volcanoes it probably works CO2. The forcing is there, it just gets corrected by negative feedbacks. Mainstream have spent the last 25 years doing everything possible to avoid the obvious: that a stable climate is dominated by negative feedbacks. They’be been desperately trying to make things work with positive water vapour feedbacks but this has included dropping the Lacis et al 1992 value of 30 W/m2 * optical density to 21 W/m2 * optical density in order to get the models closer to the climate record. Rather then fix the model (be adding neg. f/b) they “corrected” in the inputs. Yet another case of don’t fix the model, fix the data. Very interesting. It appears someone has been tweaking MODTRAN. It will be interesting to see whether you get a credible reply. Well, not my model exactly. 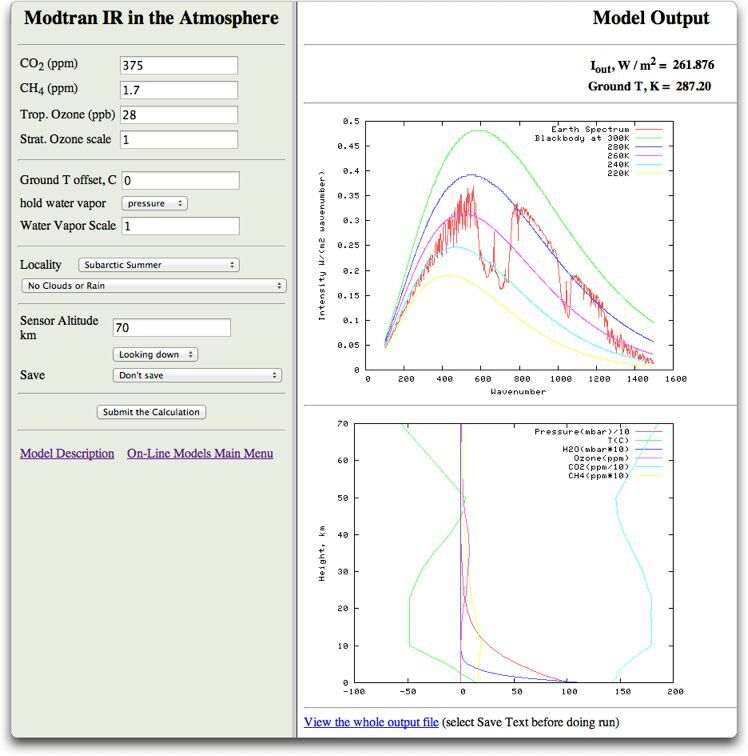 I developed and host a web interface to the modtran model of atmospheric infrared radiation, an early example of a line-by-line code which I downloaded and use to teach and as part of a textbook. Now David C. Archibald from Summa Development Limited, Perth, WA, Australia claims that my “University of Chicago modtran facility” proves that global warming won’t happen. It looks like David Archer’s site that I cam across years ago, was calling the U.C. installation. But if this is run by someone linked to RC, you can bet your arm they been “correcting” the source code. BTW Moderate Resolution Atmospheric Transfer (MODTRAN) code, not some amalgam with Fortran. MODO 4 contains original MODTRAN 4 executables , MODO is commercial software but trail 30d licences are available on request. For anyone wanting to check out ‘old’ versions this may be a good option. Thus for doubling of CO2 concentration the forcing would be 3.71 W·m-2 . The 4.52 forcing figure cited here comes from an older Hansen paper (1988). It is calculated from the old equation ΔF = 6.52·ln(C1/C0) which IPCC was using in erlier assessments. The Myhre estimate is derived from line-by-line, narrow band and broad band molecular models. Note also that Myhre evaluates the forcing due to changes in concentration of all Well Mixed Greenhouse Gases (CO2, CH4, N2O, CFCs) at 2.25 W·m-2 (CO2 concentration was 374 ppm when he made this assessment, it is now approaching 400 ppm, an additional forcing of 0.36 W·m-2). The MODTRAN programm is based on line-by-line band models with a width of 1 cm-1. This may be too coarse and miss lines. Note that absorbance is also temperature dependant. If you want to play with standard atmospheres (tropical, polar, temperate, etc.) there are quite a lot of numbers to crunch. A reciprocal centimeter bandwidth is just an increment of the spectrum over which the calculations were performed. the frequency is 600E12 Hz. Add 30E9. Convert back to wavelength and you get 499.9750e-9. Roughly. So that I could believe. .025 nm intervals at 500 nm. It does seem excessive though for a MODerate program. It would make more sense to me to state that it is calculated over some x nm interval or better over some frequency interval to say it is calculated over 1/1cm intervals is confusing. But I don’t operate in that domain. Maybe the nomenclature used is standard. politicians looking to demonize CO2. Tax it actually. But demonization is a step on the way to taxation. I used the MODTRAN online tool Willis pointed us at the look at upwelling radiation at 0.1km in a US standard atmosphere. The result is essentially black body radiation at 288K. But if I’m over the ocean, is upwelling IR really black body? Won’t it be influenced by the chemical composition of the ocean? I don’t know much about this space, but I’d have thought the H2O in the ocean would emit pretty much on the atmospheric H2O absorbtion spectrum, making the H2O GHG effect even greater over the oceans. Commercial MODTRAN has some ‘liquid water surface options’…..anybody seen anything on that? Here is a VERY good early paper on the subject. A special note here is that Gavin Schmidt, James Hansen, et al, specifically trace their lineage in climate science back to Plass. They ignore Kaplan because he, using the actual data gathered by the USAF for their “upper atmospheric research” (aka research into IR sensors for heat seeking missiles), shows that Plass’s numbers are much too high. The paper goes into the details on the subject. This was back when scientists were driven by science, not ideology. rate, Quart. J. Roy. Meteor. SOC8. 2, pp. 310-324.
climatic change, Tellus 8, pp. 140-154.
on climate, American J. of Physics 24, pp. 376-387.
atmosphere have been calculated for several atmospheric models and with various cloud heights. The variation of the fluxes with carbon dioxide amounts is determined, and its effect on temperature discussed. Plass’ estimate of a temperature drop of 3.8′ C due to a halving of the carbon dioxide concentration appears to be too high by a factor of two or three. Well increasing H2O itself leads to decreasing surface Temperatures, so that would not be an enhancing effect even if it were true that more CO2 gives more water. Willis, here is a reference to the original somewhat arbitrary definition of the bottom and top of the atmosphere by Kaplan, who uses Plass’s definitions. A lot of this stuff was originally decided in the 1950’s, but modern climate scientists simply assume it without delving into whether the assumptions used back then are still valid.. The 1,000 millibar level was taken as the bottom of the atmosphere and the IOO millibar level as the top of the atmosphere. The net upward flux was calculated at both of these levels as a function of thermal structure and cloud heights. The bases and tops of clouds were chosen in hundred millibar intervals; and the lapse-rate of temperature was considered constant with height. It was assumed that the ground temperature was the same as the adjacent air temperature. Rert, you are confusing apples with oranges. The deep oceans act rather like a “Black Body” in that at least within the range of the solar spectrum; what goes in never comes out. I can confirm, from fishing on the quiet Sea of Cortez, that the deep ocean shielded from the sky, looks black and NOT blue. (did the experiments myself). Consequently one would expect the ocean surface to emit somewhat like a black body in a thermal spectrum dependentonly on the ocean Temperature. That spectrum, is centered in the 10.1 micron region (288 K), and as luck would have it, the absorption of water at those frequencies, is almost total in just the top 100 microns of water. So the expected emission from the ocean is indeed a 288 K or thereabouts thermal (BB like) spectrum, and since that is 70+ % of earth’s surface, it must be what the earth largely looks like from space (sans clouds ). You won’t see much of any H2O characteristic spectral lines from a warm ocean surface. Willis: Others have noted that radiative forcing is defined as the NET change in flux at the tropopause after the stratosphere has come into equilibrium with the changed CO2 or other forcing. Unlike the troposphere, where convection plays the major role in determining temperature, temperature in the stratosphere is controlled by radiation and the equilibrium temperature change at all altitudes can be determined by using the forcing to predict a modified temperature profile, using the modified temperature profile in a new radiative transfer calculation, and repeating this process until the results converge. I don’t know if MODTRAN has this capability. Radiative forcing is the NET change in flux across the tropopause. You should set the “Altitude” to LOOK DOWN and to LOOK UP from the tropopause (a different altitude in the tropics, midlatitudes and the poles). With more CO2 in the stratosphere, its radiative cooling is enhanced and its temperature drops. Therefore, the DOWNWARD flux from stratosphere will drop from the lower temperature (if the calculation allows the temperature to change) and from the increased opacity from CO2. Both factors should REDUCE the calculated reduction in in the UPWARD flux. Hansen’s value of 4.5 W/m2 for 2XCO2 was reduced to 3.7 W/m2 by more precise work, mainly by Gunnar Myhre et al. He appears to be most responsible for the IPCC “consensus” on this subject. A Google Scholar search of his name and “radiative forcing” will turn up many papers that are not behind paywalls. I remember looking at the paper below, but being frustrated that his complete methodology was spread over multiple papers. Talking about MODtran / HItran / LOWtran / whatever , I’m under the impression that these calculations do accurate quantum mechanical computations of ALL of the myriad of molecular spectral lines that each gas component can generate / absorb; at least for any single GHG molecule, based on the known energy levels of these molecules. So what the very coarse low resolution IR spectrometers claim for GHG absorption bands, are in fact these complex arrays of many fine lines. I happen to have an actual high resolution chart for the atmospheric transmittance of a 10 km long path at sea level, in the “Infrared Handbook.” in chapter 5 fig 5.2 It is hundreds of lines, and yet covers only 0.025 micron bandwidth, from 10,900 to 11,200 cm^-1. They say it was computed using line by line numerical integration. There’s too much info in the reference, but it is from the Air Force Research Lab from 1974. R.A.McClatchey, and J.E. Selby relating to laser attenuation, and it appears to be a multiple layer (atmosphere) integration. The math is too obstruse for me to describe here, or I would be here all day. Some years back I described a hypothetical “Cocktail Party Physics ” situation; which at the time caused Dr, Roy Spencer to spill his coffee.. Suppose we had a WUWT cocktail party at some Las Vegas hotel Ballroom; maybe a thousand or so of us, having a good time networking..
Well there would of course be some stars present, like Anthony and Willis, Dr Roy, and Prof Lintzen, and Prof John Christy; well even Michael Mann, might show up. Well everyone wants to hear from the stars, or at least try to bend their ears. So there’s Dr. Roy, with a ring of six fans around him, each trying to get his attention. Beyond them a second ring of 12, just like a 19 strand cable. The third ring of 18 makes 37 folks almost none of whom, are actually able to talk to Roy. Well Willis has the same problem, and also Leif Svalgaard; they are all being mobbed. So Dr Roy thinks of something he meant to tell John Christy; but there is not a snowball’s chance in hell, of him, being able to see John in that crowd, or even know where he is in the ballroom. Roy is totally isolated, and will have to tell Christy later. As far as one CO2 molecule is concerned in the atmosphere, there is not another like it in the whole universe; it is alone and must field the questions (or photons) all by itself. So nyet on the idea that these CO2 stars, are part of a giant conspiracy acting in consort; each is totally isolated, and obivious to anyone else of influence. Now Mother Gaia of course knows where every single CO2 molecule is. She keeps track of all of them, and every time one makes a catch or tosses out a pitch, MG makes not of it, and updates the score accordingly. Well we can read the scoreboard, and see what the total is, but we never see the play by play like MG does. So the atmosphere does what it is supposed to do, but the idea that the GHG molecules are co-operating with each other is just plain silly. So what if a certain layer thickness of air has enough CO2 molecules in it to grab all the photons in a certain 15 micron “band”, and then release them somewhat shaken up by the cocktail party jostling. If we add more stars, well it just takes a thinner layer to grab all the available photons of the right kind, and then quickly release them to wander round the ballroom, until they run into the next star centered bunch. So forget about this “saturated” business; all it means is that more catch and release events happen, but it doesn’t mean the fishing stops. Also the notion that somehow the increase in CO2 somehow just “nudges out the edges of the absorption “band” and that results in the “logarithmic response to the CO2 increase. Well surely that too is nonsense, given that the “band” is really a large number of narrow lines, and each CO2 molecules is quite unaware of the presence of any others. Any of those lines is going to behave pretty much the same, all the time. Dear willis, FYI, I posted comments as tom watson and toms3d. So I wil repeat I find your posts and analysis informative and interesting. As you say I did not read the current modtran manual. I am in the middle of integrating a migration from fc13 to ubuntu 13.10 and firefox crashes are my lame excuse. But Fact even NIST cannot provide molar absorptivity values. Do you believe in an extinction coefficient distance? Damn, as I came up with, well tried to come up with a visual analogy I saw why my objections to modtran were not consistent with what I saw in my mind. I have run modtran varying altitude and humidity. I’m not sure what is defined as relative humity. Using dewpoint temp would be specific. Can I assume 100% humity at a temp is using that as a dewpoint? Let us assume modtran can tell us what is the Iout way up or wherever. So what does modtran imply if your use relative humidity of 100% at different temps and vary C02. There is no change in Iout. What are the prevailing dewpoints as you get to the tropics. Where is most of the suns Iin hitting the earth. I still did not read the modtran manual, but changing locality simply changes the ground T offset = 0 temp. Consider, if the dew point is 45F vs 70F. H20 ppm varies from. 10K ppm to 25k ppm. H20 as vapor simply looking at global dewpoints is absorbing all the IR that is to be absorded. I guess modtran can tell us something. It’s all how you ask it questions. It’s all how you interpret the meaning of the results. Willis, I love your posts. They get me thinking. Thanks again. Now back to finguring out why firefox 28 keeps crashing my u13.10 arrrgggh…. I donot comment regularly in wordpress blogs. I go to leave a comment not logged in and fill in my name etc and then when I post I have to log in. The post says Tom Watson the name I entered. It seemed that when I posted already logged in the software used my login user name toms3d sayes. Not certain what was what I figured full disclosure was the best course of action. Another thing that’s not obvious on that page is that if you enter a non-zero temperature offset then an additional input field appears, which allows you to choose between constant water vapor pressure and constant relative humidity (with the later effectively incorporating the “amplification” effect of water vapor). BTW, would you mind please sending me an email? Thanks. then you simply aren’t trying to understand. the answer is basically very simple. you are trying to solve a jigsaw puzzle using a hammer. Here is another mystery for you! I had posted a comment earlier. I wanted to save the location of the comment so I saved the URL of the comment to a Word file, selected the text, and clicked on Insert>Hyperlink to make the URL active. Note that the “#” sign in the URL was changed to “%23”. The text of the URL in Word shows the “#”, and hovering the cursor over the link displays the URL link with the “#”. Copying the link directly back to the browser makes WUWT display “Apologies, but the page you requested could not be found.” Changing the “%23” in the browser URL bar back to “#” correctly displays the comment. Why does Word change the “#” to “%23” in the URL (but displays the “#” as the hyperlink)?? This appears to be a recent problem. Do you think that Gavin threw up a map of real values? Gavin, Gavin Schmidt put up a valid display? Bwahahahahahah! More thought and less naive acceptance will get you farther in Science. I don’t care who posts it, check it out. Use their equations, then write your own. Test both against measurements. Check their data, look for other similar data, check the equations there. It’s possible to learn, and then you won’t just be a parrot. I like modtran. At one time I used it to initially validate the operation of my HITRAN 1-d model. Where there were descrepancies, I combed my code looking for problems and ultimately found them. I wouldn’t say there was perfect agreement but I thought it did a good job. Although I did play around with the model for AGW purposes, its purpose was for something different. It became obvious that this sort of effort provides very little information because the co2 doubling is around 3.7w/m^2 in clear skies and the Earth typically has less than 40% clear sky. finding that hansen exagerates (or worse) is hardly a new discovery. This is a nice article and worth learning for those trying to come up to speed on the subject. Modtran is a nice program (or was) and provides (or provided) reasonable information and is useful for gaining an understanding. It’s not really of much use for ascertaining proof or falsification of CAGW hype. Hi Willis, love your stuff! I’m assuming you meant FORTRAN? I cut my working programming teeth on COBOL. There is a surprising amount of COBOL still out their in banks, stock exchanges, enterpsise accounting systems and elsewhere. RPG also still forms a huge amout of the legacy code code base on larger organisations as well. There are versions of COBOL for Windows and other plstforms that still get updates and thereis even an object COBOL out there in the wild 🙂 ALGOL on the other hand. with regard to the oceans acting as a “blackbody”, nothing could be further from the truth, they are in effect a ”selective coating” covering 71% of the lithosphere. This is one of the greatest errors in the very foundation, not just of AGW, but the whole radiative GHE hypothesis. A fist-biting error. The greatest error in the history of human scientific endeavour. Empirical experiment shows that in the absence of atmospheric cooling and DWLWIR, the sun can drive our oceans to 80C or beyond. That’s a 98C error for 71% of the planet’s surface at the very foundation of the AGW inanity. The sun heats our oceans. The atmosphere cools our oceans. Radiative gases cool our atmosphere. 97% of climate “scientists” are assclowns. It really is that simple. A non-radiative atmosphere cannot effectively cool itself, therefore it cannot cool the oceans. Well Konrad; you do seem to be adamant in your assertion. It is well known, that the total spherical (hemi) reflectance from the deep oceans at solar spectrum wavelengths is about 3%, making the absorption by the ocean about 97%; that’s where all the solar radiant energy is converted into “heat”. It is also well known that the absorptance of water at LWIR wavelengths (from 3 microns to 100 microns), is in excess of 1,000 cm^-1, so any LWIR radiant energy from the atmosphere, is attenuated to less than 1/e in 10 microns of water, or down to 1% or less in 50 microns of water. So we then have the deep oceans absorbing 97% or more of both the short wave solar spectrum energy, and also the entire thermal spectral range of LWIR that is the subject of atmospheric warming physics. So from now on, I can use your authoritative information that those oceans do not emit in any Black body (or 97% gray body) fashion, as definitive proof, that Kirchoff’s Law regarding equality of specral radiant absorptance and spectral radiant emittance, DOES NOT hold for earth’s oceans, so they are in no way near thermal equilibrium. Thank you for straightening that out for me. ps is lithosphere something to do with rocks ?? Everything that is at a Temperature higher than zero K emits a thermal continuum spectrum dependent on that Temperature. At 300 k, that spectrum would peak at 10 microns wavelength. So at Temperature of 1 K, the radiation spectrum would peak at about 3,000 microns, or three mm in the microwave region. So earth’s atmosphere is certainly emitting a thermal continuum spectrum peaked at somewhere in the 10-15 micron range. But given the low molecular density, and hence collision rates, and the low collision energies at zero or lower Celsius Temperatures, the thermal radiant emittance is very low. For the main atmosphere gases, being diatomic, the radiative polar moments (antennas) are a transient consequence of distorting collisions. Water molecules on the other hand, have a significant dipole moment due to the 104 degree bend, so it can emit quite well thermally. So earth’s atmosphere is anything but non-radiative; just low density and emissivity. You need HITRAN database to set the parameters in the LBL calculations. A set of parameters and algorithms run in computers is a model. It’s not a band model but a HITRAN LBL model. Anyone here understand all this? I’m not sure if that was a response to my post. However I am most certainly not claiming our atmosphere is non-radiative. Quite the opposite. The majority of energy leaving our planet is as LWIR from the atmosphere. What I am pointing out is that in the absence of atmospheric cooling and DWLWIR our oceans would not be at the “blackbody” figure of 255K determined by climastrologists, rather they would be near 353K. Ocean surface temps are currently around 288K. Therefore our atmosphere is not warming our oceans, it is cooling them. Radiative gases are the only effective cooling mechanism for the atmosphere. AGW is therfore a physical impossibility. What about the Arctic then? I suppose TOA (70 km) is pretty correct there and that means that the effect is even more less there than in the Tropics. There will be a lot more heat going north and south from the Tropics, especially the northern hemisphere will heat up more than the rest of the globe. The imbalance between the influx and out flux in the Arctic will grow. I still want to see the energy balance for different areas, especially the Atctic. I suggest there is no balance anywhere, except for a certain time for every place outside the Tropics. I have no idea how it looks like in the Arctic in the summer time. Could it be balance or not? statements and politics. And the latest updates on various subjects, not just those that are scientifically based graphs, that I find very boring actually. Cut to the chase what is the conclusions of these observations. I am not at university any more but I can comment without giving references. Howsmart, suppose the three tablespoons were full of food coloring or ink, and the tub of water was sitting outside in the sunshine. You see, that’s what CO2 in the atmosphere is: a dye. It “colors” the atmosphere in non-visible parts of the light spectrum, but it greatly affects the passage and absorption of light at those wavelengths. The reason that additional CO2 has only a small GHG effect is not that there’s so little of it, it is because there is already so much of it in the atmosphere. MODTRAN calculates that 50% of the warming effect of current (400 ppm) CO2 level would be accomplished by just 20 ppm CO2 (for a tropical atmosphere w/ constant relative humidity). The NCAR radiation code says that 40 ppm CO2 would be needed to get 50% of the current CO2-caused warming, rather than 20 ppm, but, either way, the lesson is clear: we’re well past the point of diminishing returns w/r/t the warming effect of CO2. Thus showing that the poles get more downwelling radiation than the tropics when CO2 is doubled .. which is what is expected. At any rate, the point is that the instantaneous change at the surface can not be determined by looking down thru the atmosphere. The dye analogy doesn’t really work for radiative gases. This is because they act to both warm and cool our atmosphere. That is to say the warming effect decreases with increasing concentration, but the cooling effect increases. The primary cooling mechanism for our atmosphere is LWIR to space from radiative gases in our atmosphere. In fact the amount of LWIR emitted to space by radiative gases is more than twice the net flux of radiation absorbed by the atmosphere from surface LWIR and direct solar radiation combined. This is why MODTRAN is worthless for determining atmospheric temperature response to increasing levels of CO2 or any radiative gas for that matter. The only purpose for MODTRAN was determining atmospheric IR opacity for design of air to air missiles. Radiative subsidence of air masses plays a critical role in governing the speed of tropospheric convective circulation, the primary energy transport away from the surface. Change the concentration of radiative gases and you change the speed of the primary energy transport in the atmosphere. That is one of the old climastrology tricks. As radiative gases cool at high altitude and warm at low altitude, if you ignore buoyancy changes from increased radiative gases and hold the speed of tropospheric convective circulation constant, then models show low altitude warming. Radiative gases both warm and cool our atmosphere. The cooling effect is more than double the warming effect. Adding radiative gases to the atmosphere will not reduce the atmosphere’s radiative cooling ability. Great, you’re a genius and I”m not trying to understand, whatever floats your boat. Me, I’m just trying to do the best I can in the face of charming people like yourself, who produce nothing but want to tell others what’s wrong with them. Critics who produce nothing are always those who are a failure in their field. Lead, follow, or get out of the way, Jai, I’m happy with you doing any of those … but right now, you’re just in the way. Certainly you can … and just as certainly, you will not get any traction if you do. Opinions don’t count for much around here, mine or anyone else’s. What would cool more quickly, a tub full of warm water or a tub full of warm seltzer? http://modtran5.com/purchase/index.html with a discount for educational buyers. Except that during the time before a CO2 molecule emits it endures many collisions from neighboring molecules, so it does ‘know’ they’re there. That gives you collisional broadening. Temperature and pressure dependent. Also there is broadening caused by how fast the molecule is moving (and which direction) when it emits, that’s Doppler broadening. This is temperature dependent. Shows the effect of total pressure on a CO2 spectrum at 0.1 atm, 1atm and 10 atm respectively. That is the value that Hansen used back in the 80s and was the accepted value then, since then the evaluation is that it’s about 3.7. A factor in the polar values may be that MODRAN doesn’t take into account the inversion layers that occur there? Did I not cite the source for Hansen’s value? Hang on, lemme check … yes, of course I cited it. Was it from “the 80s”? Why no, it’s from 2005 … read the dang citations, Phil. I go to a lot of work to include them, and it will prevent you from looking foolish. Nevertheless Willis, Hansen was using a value in excess of 4.0 in his 1988 paper which dated from ~1979 hence my comment, as to when it changed that’s another matter (probably 2007 AR4). It was regarded as a high value even then as I recall. So? In the head post, I quoted a value of 4.52 as Hansen’s claimed sensitivity. Are you seriously claiming Hansen used that value in 1988? If so, please post the citation. But now, rather than admit you didn’t read the citation, you’re backpedalling and doing lots of handwaving … are you aware that you are committing scientific suicide? There’s nothing that destroys a person’s scientific credibility faster than being unwilling to admit error. Well I already mentioned BOTH Temperature, and Density broadening, as manifestations of Temperature and altitude changes, so yes the GHG molecule is certainly aware of its atmospheric gas surroundings. But it remains unaware of another GHG molecule in its vicinity. I can see a linear increase in LWIR absorption due to a small increase in the number of GH molecules doing the absorbing; but I see no credible mechanism for slowing that rate down below linear to logarithmic, for example. I might agree the relation could be non-linear; I can see no reasonable justification for calling it logarithmic, which is a precisely defined mathematical function. One molecule to two molecules per volume; equal to one million to two million molecules per volume is what means logarithmic. So we have at most a 25% of one doubling record of credible CO2 concentration. ; not even one order of magnitude change. Anybody ever do a controlled lab experiment over just doubling of CO2 or better yet, one decade increase ?? It’s called the curve of growth George, as you go from a weak absorption via a moderate absorption to a strong absorption the line shape changes and so you go from linear through logarithmic to square root. CO2 at the current level in the atmosphere are in the approximate logarithmic regime whereas methane is in the square root regime. You can find other versions by googling ‘curve of growth’. Hansen et al., J. Geophysical Research, vol. 93, pp 9431, 1988. 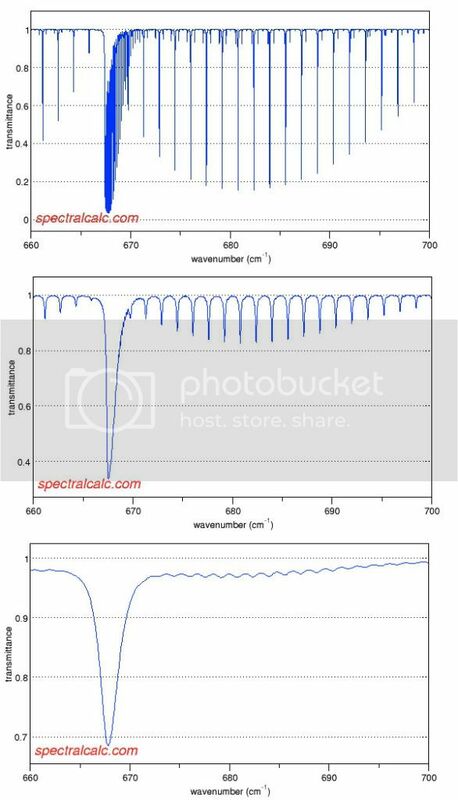 I got very similiatr results using tools from the http://www.spectralcalc.com website, from Gats, Inc. Some are available at no charge. A full set requires an available subscription ($45 for a month, $95 for 3). It takes a lot longer to run than MODTRAN, but should be more accurate. One has to breakdown into runs a number of wavelength bands and each one can take up to a few minutes. After doing my paper, I read that more CO2 causes stratospheric cooling which some how causes the forcing to increase which requires a correction. I estimate this at about 15%. so I end up with 2.9 W/m2, still musc less 3.7. I think the 3.7 W/m2 accepted number is too large. Some people claim the equilvalent thing of the corrction is to run the obsevation point at the top of the tropsphere instead of at 70 to 100 km at the TOA. However this misses out on the CO2 emissions around 15 microns where the absorptions are so strong that the final emissions level extend above the troposphere where the temperatures can actually rise with altitude, thus provide, more not less, heat to space with mode CO2. Figure 3 in my paper shows this and Figure 9 shows for clears skies measuring outgoing radiation reduction for 2x CO2 at 15 km around the top of the troposphere is about 50% higher than seen at 70 km. This is too much of a correction it seems. (BTW, how does a person paste a bimap here). I would like to compare with MODTRAN. What is the cost? Additional break down of results are below. For each case of clear and cloudy skies, and for each bandwidth where CO2 is active, the outgoing radiation at 100 km from 1x and 2x CO2 were determined, and from that the increase. Each run took about 2 to 3 minutes. The results are shown below in the four tables. Note the significant reduction for the cases from the cloud tops. And at 10 km, the heat loss increases slightly with 2x CO2 because the altitude’s increase with temperature at the higher attitudes. The preceding work centered on the 12 to 18 micron range because this is the major band where CO2 plays a role. However we also used the radiance tool over the full range that virtually covers the complete longwave spectrum associated with the global average temperature. The results are shown in Table A5. The total leaving the top of the atmosphere under clear skies is estimated at 265.9 Wm-2, close to the satellite data of 265 Wm-2 as reported by Kiehl and Trenberth (1997). When this was repeated for the three cloudy cases, the totals dropped from 265.9 to 240.2, 188.2 and 135.2 Wm-2. The combined total, using the weighting above, drops to 235.4 Wm-2, compared to 235 from Kiehl and Trenberth. The agreement of the radiance tool with satellite data regarding outgoing radiation provides confidence in using it to estimate how it will change with increased CO2 concentrations. Note: Pasting tables from my Word document did not work good even though I manually adjusted them in my view of the comments before submitting them. Hmmm, guys I thought that space was freezing cold and a vacuum. Maybe my physics teacher was wrong. guys I thought that space was freezing cold and a vacuum. Space has no temperature because it has no particles. Temperature is a measure of the kinetic energy stored in matter.